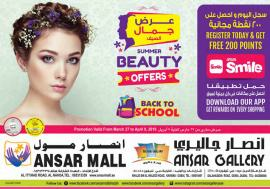 Ansar Mall - Summer Beauty Offers & Back to School. Offers extended up to Apr 24th. Ansar Mall - Less Than Cost. Offers valid from Apr 3rd to Apr 6th. 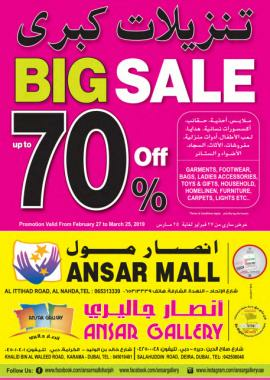 Ansar Mall - Big Sale. Up to 70% Off. Promotion valid from February 27 to March 25, 2019. 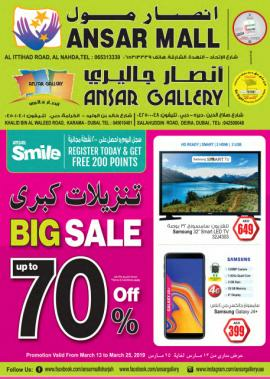 Ansar Mall - Big Sale. Up to 70% Off. Part 2. Offers valid from March 13th to March 25th. Ansar Mall - Best Buy Part 2. Promotion valid from 13th to 25th February 2019. Ansar Mall - Best Buy. Promotion valid from January 30 to February 12, 2019. 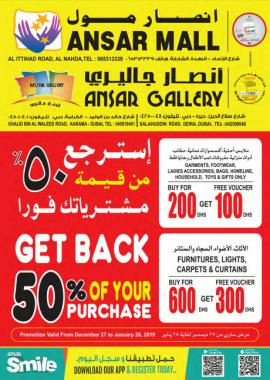 Ansar Mall - Year End Offers. Get back 50% of your purchase. Promotion valid from 27th December 2018 to 28th January 2019. 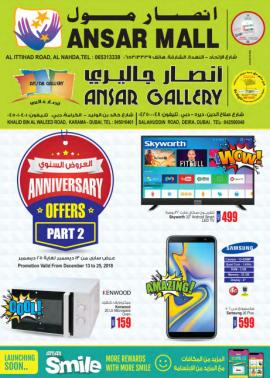 Ansar Mall - Anniversary Offers part 2. Promotion valid from December 13 to 25, 2018. 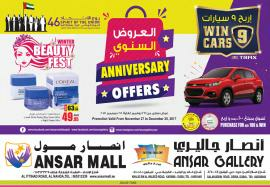 Ansar Mall - Anniversary Offers. Promotion valid from November 28 to December 12, 2018. 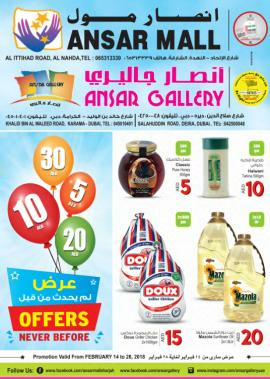 Ansar Mall - AED 10-20-30 Offers. Promotion valid from 26th October to 13th November, 2018. 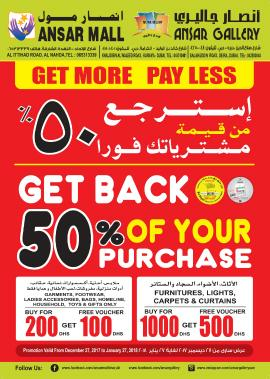 Ansar Mall - Back To School & Cost To Cost offers. 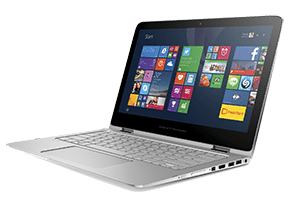 Promotion valid from August 29 to September 9, 2018. 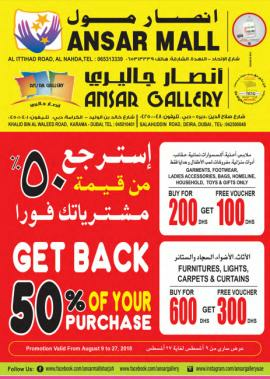 Ansar Mall - Get back 50% of your purchase. Promotion valid from August 9 to 27, 2018. Ansar Mall - Less Than Cost. Promotion valid from July 12 to 24, 2018. 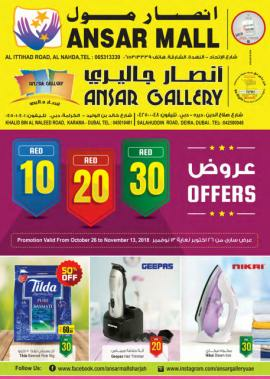 Ansar Mall - Amazing 10-20-30 Offers. Promotion valid from June 21 to July 11, 2018. 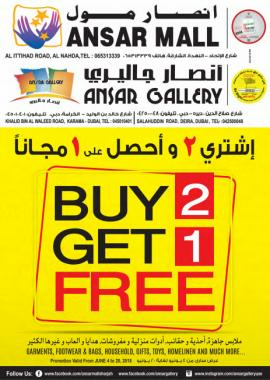 Ansar Mall - Buy 2 Get 1 Free. Promotion valid from June 4 to 20, 2018. Ansar Mall - Ramadan Surprises. Promotion valid from May 24 to June 6, 2018. 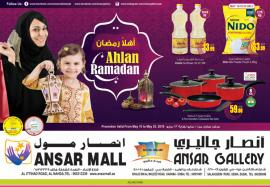 Ansar Mall - Ahlan Ramadan offers. Promotion valid from May 10 to May 23, 2018. 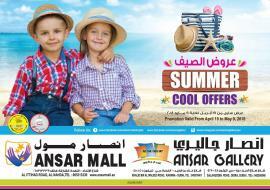 Ansar Mall - Summer Cool Offers. Promotion valid from April 19 to May 9, 2018. 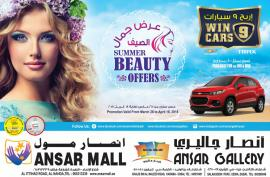 Ansar Mall - Summer Beauty Offers. Promotion valid from March 28 to April 18, 2018. 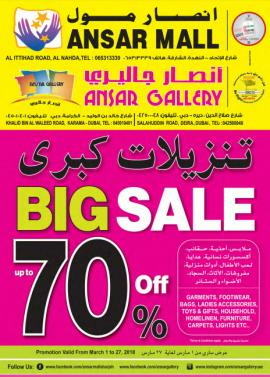 Ansar Mall - BIG SALE up to 70% Off. Promotion valid from March 1 to 27, 2018. 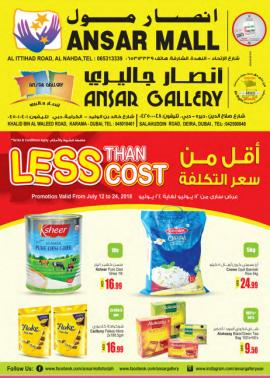 Ansar Mall - OFFERS never BEFORE. 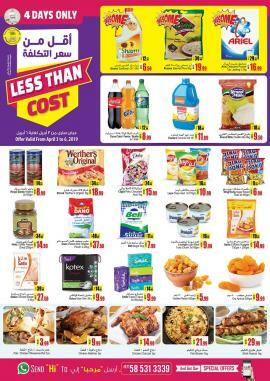 10-20-30 Dirhams offers. promotion valid from February 14 to 28, 2018. 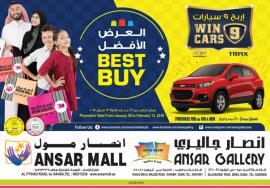 Ansar Mall - Best Buy offer. Promotion valid from January 28 to February 13, 2018. Ansar Mall - Get Back Half Of Your Purchase. Promotion valid from 27th December 2017 to January 27, 2018. 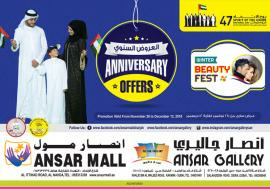 Ansar Mall - Anniversary Offers. Promotion valid from November 27 to December 25, 2017. 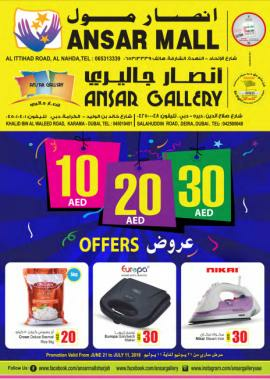 Get all information about Ansar Mall sale in Sharjah, Ansar Mall special offers, Ansar Mall Sharjah offers, Ansar Mall offers catalogue and Ansar Mall promotions by browsing through TomatoSALE.